I really don’t know how Geno does it. Not only is he consistently blogging on Affiliate Marketing and managing his OPM Clients, he’s a dedicated family man. So, how he found the time to squeeze in the writing of one of the most comprehensive books on Affiliate Management that I’ve ever read — is beyond me. The way I see it, just compiling all of the information, stats, examples and screenshots should have taken forever. Then, consider the time it would take to research all of this information — and that’s another “forever”. And finally, the time it should have taken to write such an impressively detailed book should be yet again, forever. But, Geno has lived this research, examples, and details for years now. It’s in his blood. The only way this book could have been written in such depth and so well-organized is through Geno’s years of “living it”. The result? An extremely comprehensive book! 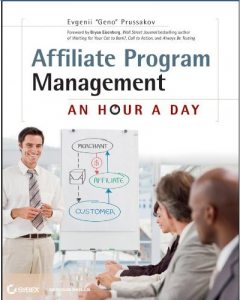 “Affiliate Program Management: An Hour a Day” by Geno Prussakov is essentially a “How To Course in Book Form. It covers basic and advanced topics and is an incredible reference and guide. It is well researched, well written and well presented. Delivered in 5 main “parts”, and broken down into 18 detailed chapters, this book is a wealth of information for Affiliate Marketers. It includes reference guides, tips and is loaded with specific (real world) examples. If you’re in Affiliate Marketing or want to be, this book is a must-have. If you’re a prospective merchant looking to start an Affiliate Program, you definitely need this book. Geno’s books are can’t-miss, priceless additions to my library shelves. I can hardly wait to get my hands on this latest, even though I’m not an affiliate program manager. Publishers need his point of view, too! I am an Affiliate Manger and follow Geno on Twitter and of course on his website. His advice is invaluable. I love the book. When I have down time I just open to a page, read and execute. It is a great “tickler” for me.